A maximum of one vehicle and one RV is allowed for each space. Please ask us about storage sites for any extra vehicle/trailers etc when you make your reservation. Storage rates available on request. 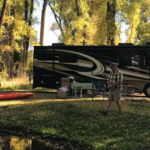 We offer 3 categories of RV sites based on location and the dates reserved. Pricing starts at $49/night plus tax, and go up to $59/night plus tax. Our best sites in the park. These sites are located around the edges of the park, they tend to be less densely populated, and many are located on the pond. All 50 amp connections. Traditional RV sites scattered about the park. These sites tend to be a bit larger and feel a bit more spacious than our Value based sites. All 50 amp connections. 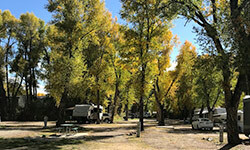 Traditional RV sites located amongst the towering cottonwood trees. 30 and 50 amp connections. Quiet campground. Friendly hosts. We were shown to our camp site by one of the hosts. Feels like you are in the woods far from the beaten path, but still class to town. Definitely recommend! This place was amazing! Wonderful new owner. He and his employees helped these newbies out with setting up our camper for the first time. They stayed up and waited for us as we got in much later than we planned! The park was full of nice people who made our stay super relaxing and enjoyable. We will be back again and again! Loved this RV camp! From the start, the camp host and hostess went above and beyond to get me set up at my camp site. They even loaned me their space heater so I wouldn’t have to go buy one. The sites are spacious and shady and the entire camp has a very safe and friendly vibe to it. I was especially impressed with how well the bathrooms are maintained. I’ve been to a lot of RV campgrounds and this one has been the best, by far. The very friendly owner helped us get checked in to our cabin around 7:45pm (w/ no prior reservations). It was too cold to camp in a tent for our 1yr old and this was an amazing second choice! Great price as well. We will be coming back, and recommending them to other travelers! It was a beautiful campgrounds with a lot of RV campers. The site had a play ground but I didn’t see any other children. 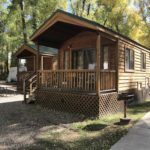 We were a bit concerned having read many of the reviews, but after learning it was under new ownership we thought I would give it a try as Gunnison had much to offer. The new owner has clearly worked hard to improve the prior issues of the park as my experience was wonderful. Clean park, clean restrooms and very accommodating staff. 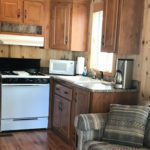 Based upon our experience, you should not fear some of the older, poorer, reviews as it clearly appears the new owners cared about us our rig and our experience. 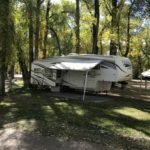 Gunnison is a great place to spend a weekend or a month. So much to do from hiking, 4-wheeling, fishing or simply relaxing. Upon booking a reservation, your credit card will be charged for the “greater” of 1 night stay, or 20% of the entire bill. From HWY 50 turn north on Main St. ( HWY 135) for 2.5 miles ( If you cross the bridge to river you went to far).Turn right onto County Rd. 11 by the mail boxes and the blue campground sign. Go 300 yards, campground is on the right.